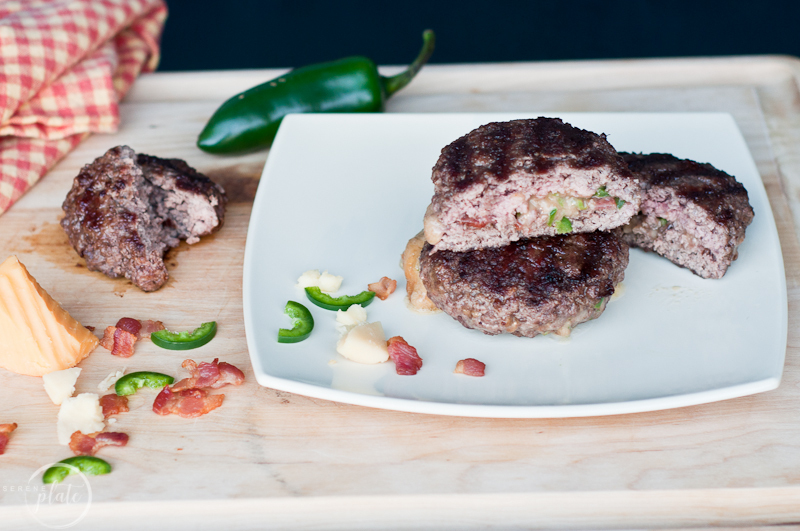 These stuffed burgers are full of cheese, bacon and jalapenos. 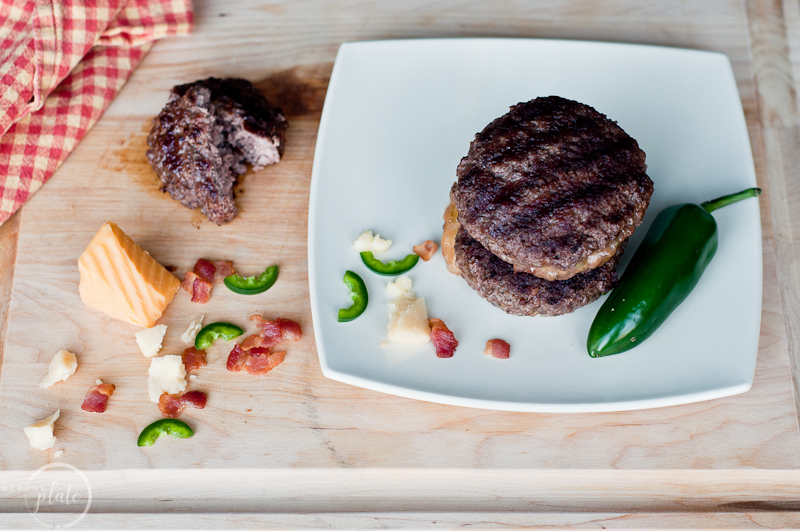 Three things that can turn any burger into a unique surprise, exploding with flavor in every bite! Who’s ready for grilling season! I know I am! I grew up in a family of meat eaters. Big time. Not to mention, about 99% of the time, that meat was grilled. Taking ground beef and making a burger is nice. It’s traditional, common and can be smelled throughout the neighborhood. 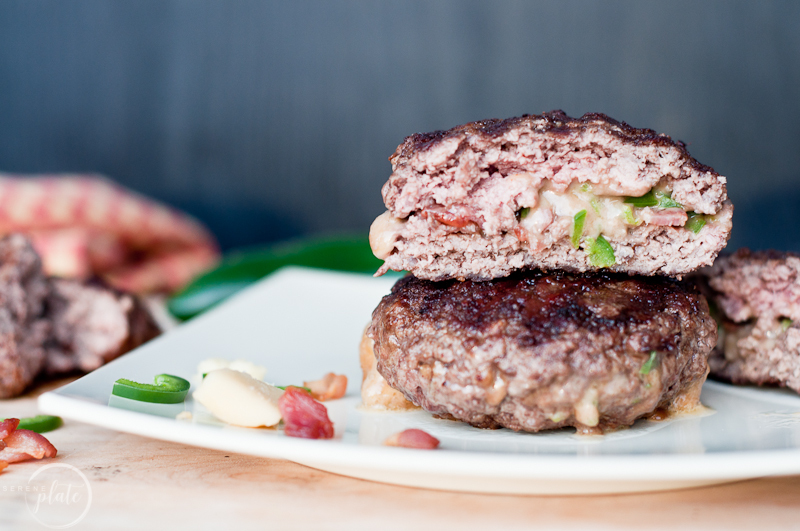 Now, taking ground beef and turning it into an epic stuffed burger is just pure brilliance. The possibilities of ingredients you can use to stuff the burgers are endless! 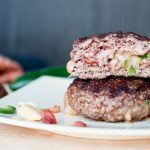 Before we get into how I make my stuffed burgers, here are some other ways to cook them. How long do you cook burgers in the oven? If your oven is set to 350 degrees F it should only take about 15-20 minutes to bake your stuffed burgers. The internal temperature needs to be at 160 degrees F. The time can obviously vary depending on the thickness of the patties and what’s inside. If they are not to packed full, it’s a good idea to try and turn them over half way through. I love to use my grill pan inside when I can’t grill outside do to weather. My grill pan for the stove-top is great, especially with stuffed burgers. This way, I am not losing any of the filling if some decide to seep out. I place them on the pre-heated pan set at a medium heat and try not to touch them for about 5 minutes, this creates a nice sear and gives you a little crunch when eating them. Flip the stuffed burgers only once. Using the grill pan still get the nice grill marks but have a little more control. How long does it take to grill a stuffed burger? I learned a cool trick for pre cooking/grill prep when I sent my husband to a cool grilling class. If you light your grill to a super high heat and spray it with a cooking oil (any cheap spray will work) the excess food from your last grill will char and it makes scraping the icky excess off really simple. I do this every time and my grill gets nice and clean. **Note that I mentioned above sending my husband to a grilling class** Well we (myself and some friends and family) did this for a group of guys for father’s day. They learned so much about marinades and the grilling process, and just had a cool guys outing. I had full intentions of “giving grilling over” to Brandon after that… but I just can’t!! I LOVE to grill! We share, most of the time. But it really is one of my favorite things. So, Brandon is often the marinade maker and preps the meat for grilling. It’s a partnership right…? 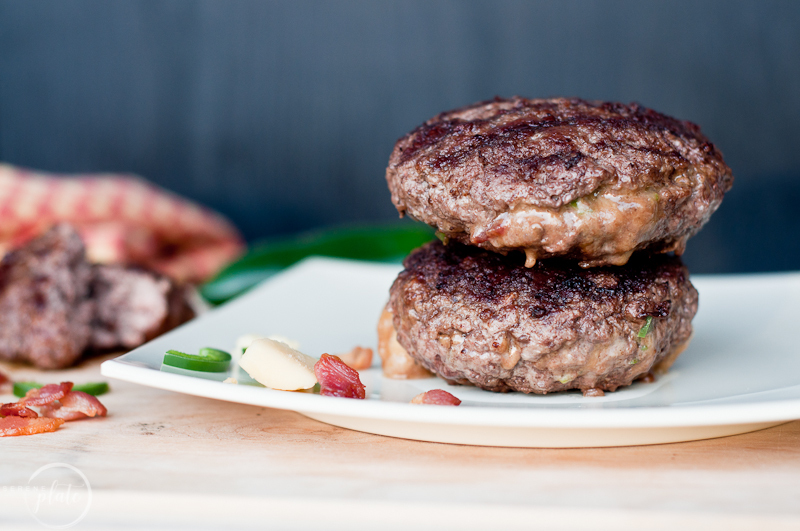 So, back to cooking your stuffed burgers on the grill. Get your grill to a nice medium-high heat, about 450 degrees F. (If you are cooking on a charcoal grill, arrange the coals to create a high heat and low heat area.) Place your stuffed burgers on and let them sit for a good 5 minutes before flipping them. Since they are stuffed, flip them gently, you don’t want and that yummy goodness to seep out! Another 5 minutes on the other side should just about do it (less time if you’re wanting more pink in the center). You can easily pick up a burger press online or at a nearby store. They are a pretty handy kitchen tool to have. Not gonna lie, I don’t have one yet and I did these burgers by hand. But now that I have, I can see the true advantage of having a press. I put together my first burger pretty well but rushed the others and some of the filling escaped. To use the press you simply add the desired amount of ground beef in the lower container and press the lid down. This creates a spot for the filling. Add your desired ingredients. Then you seal the top with another layer of ground beef. Less messy and more efficient for sure. Stuffed Burgers are my jam, I love them. I love how much you can adjust stuffed burgers to accommodate anyone who has come to dinner. You can cook the beef to their liking and give them so many options for ingredients to stuff them. It’s fun to see what combinations people come up with!! I always add a little spice to mine with some kind of pepper and no burger is complete without cheese, or a few types of cheese even! Take a look at the different options for fillings listed below. Check out these 12 genius ways to stuff a burger, and get ready to start salivating. Enjoy and please tell me how you make your stuffed burgers! Flatten two of the balls while making a well in the middle. Fill the beef with your desired fillings. I use two kinds of cheese, crumbled bacon and chopped jalapenos, most of the seeds removed. Flatten the remaining beef and place on top. Make sure you seal the edges well.